Wonderful view of Tellico Lake! Lake front Sequoya Lodge is located on the shores of Tellico Lake. Our 3,500 sq ft lodge includes a fully-equipped kitchen on both of its two levels with dishwater, microwave, ice maker, microwave, coffee makers, toaster, dishes and utensils and washer/dryer. There are 5 bedrooms and 4.5 baths that include two master suites. On the main level you will find pine plank paneling in the great room with sofas and a satellite connected flat screen TV/DVD. A dining area in the great room seats 8 and the adjoining dining room seats 12. A recreation room in the lower level has leather sofas, another satellite connected flat screen TV/DVD, and game table. A dining area in the lower level seats 6. Enclosed full length porches with ceiling fans on both levels provide relaxing sitting area to enjoy the lake views. A pier/dock provides property access to the lake. Sleeping arrangements: King bed/bath in suite 1 on main level; king bed /bath on lower level in Suite 2; 2 twin beds in bedroom 3 on main level; queen bed in bedroom 4 on main level; queen bed with .5 bath on lower level. Two large enclosed porches with lake views. Books, games and DVDS. Game table with paying cards and board games. 3 TVs/DVD. Pier/dock. Our lodge is just 29 miles from the Knoxville airport. 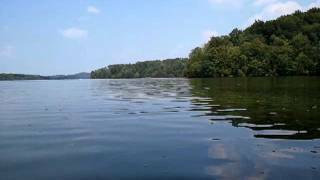 Rent a pontoon boat at the Sequoyah Landing Marina for a lake cruise at your own speed. Explore Fort Loudoun State Historic Area and learn about the 1756-1760 French and Indian War. A visitor’s center features a 15-minute film about the historical site/period and your can tour a reconstructed fort and buildings. Take a 4-wheel drive vehicle tour in the Citico Wildlife Wilderness area and see over 20 species of animals roaming in the mountains, many not native to North America. Stop in The Sequoyah Birthplace Museum which honors the history and culture of the Cherokee people. Sequoyah served as a spokesperson for his tribe in the 1800’s and he created a Cherokee writing system which he used to translate hymns and the Bible for the Cherokee people. Cancellations must be at least two weeks prior to arrival date to be refundable. All cancellations subject to $50 fee. Cancellations less that two weeks prior to arrival are not refundable unless the dates are rented. My friends and I stayed at this amazing lake house for New Year’s Eve. We were pleased with how beautifully it was decorated – full of rustic country charm. There were antique oars, maps, and other Tellico Lake themed décor throughout the house. In the morning, we enjoyed watching the fog rise over the lake while sipping coffee on the huge porch (fully enclosed with a wall of windows). We even stayed an extra day! This rental would be perfect for a large family or anyone just looking for some peace and quiet.